Those who know me from High School know that Bad Luck and I were twins. Identical and inseparable. We ate from the same plate, read from the same page and slept on the same bed. I wouldn’t be surprised to hear some people thought we were gay. I mean, I could not engage in the least of normal student mischief without getting caught. If I cleaned my portion for the entire week and everyone else failed to do theirs, no teacher would give an eff. Then, if I decided to go the same way and skip my duty on Sunday, the TOD would come out breathing fire and swearing death. If the entire school skipped preps and sat outside, the TOD would be nowhere to be seen for the entire three hours. But if by mistake I decided to just go to the toilet five minutes to the bell, the TOD would again emerge from nowhere bearing the same character mentioned before. Actually, it got to a point that when other students saw me trying to skive class, they all silently filed back in and made no noise. On the advice of one Justo Justin Justin, I used to attend preps with a bucket of water and a rug, because I knew punishment was due anyway. If I was not caught napping, I would be seen standing or facing backwards and adjudged to be making noise, then…punishment. At Box 1, I dug so many trenches and trash pits. I split and carried firewood. I washed the school bus. I even fed the cows, though that was an indirect punishment when I was tasked to slash grass. In one particular season, these punishments were so popular that on parents’ day, Jay Thuci suggested that I should stand during the introduction of non-teaching staff! Sick joker, that Thuci. But I say it was all for good measure. Me and my best friend Bad luck had a lot of fun together too! You see, unfair as it is, nature gives you one precious wild card: Adaptation. Your skin grows thicker as you have more and more thrown at you. When odds stack against you, you tend to push your luck – Bad Luck for me- further and further. For instance, I learnt to sleep in class in such a way that no one would notice. So good was my adaptation that to this day, I can have a conversation for a whole hour while in real sense I am deep asleep. I learnt to remain calm in the face of danger, so much that today I can negotiate calmly with a gun on my head. Okay, make that a knife, a toy knife. But you get the idea, yes? Bad Luck taught me to go beyond borders because whether I did or did not, I’d land in trouble anyway. And earned me a lot of friends in the process, how true I really have no time to care. Like this one time when The Axe Gang contracted me to bless their Madaraka Day Celebrations. Axe Gang was a group of students who used to study and do a number of other extra-curricular activities together. No, they did not have Axes, it was just a name they picked up from one of the movies we watched during the entertainment weekends. I’m being honest, come on, do you want to mean ODM and Wiper literally have that apparel in their offices? Madaraka day was good enough for us in school seeing as we did not have classes, but the Axe Gang was not one to settle for just that. They always wanted something extra. Why did they come to me, you ask. No, I was not part of their gang. Actually, I was not part of any gang. Not even Hill Top as was widely believed. I just consulted with each group as and when necessary. The reason Axe Gang approached me to bless their Madaraka was because I had two very crucial ingredients. One, Njamba had drafted me to help with his Science Congress wine making project, and two, my dormitory, whose team I was captaining, was in the finals and widely tipped to win the Inter-dorms goat award on Madaraka day. So the Axe Gang approached me with a proposal: Would I mind expanding the Winery a little bit so it could produce something for them to bless their Madaraka. Could I also organize some meat for them from the goat-eating party to round up the merry? What’s in it for me, I asked. They would, in return, allow me access to some of their most sophisticated highly classified revision material. They would also cheer us on during the finals, with a little persuasion of match officials if need be. Nice proposition, I said, but I don’t think I can really grant either request. One, the winery is not mine, and two, the goat meat would no doubt cause abrasion within the Umoja Dorm fraternity even without involvement of outsiders. But you have a say, they said, people listen to you. You are Mu-baddest, they said. I am a man quite easy to please, and flatter. In High School, if you called me Mu-Baddest, your prayers were answered. It is what people called me when they wanted me to scribble for them answers to Vectors and Matrix questions on my log table during exams. That’s 20 marks, btw. No, don’t try it now, like Nokia 1110, it no longer is the chit. So I said, Okay, I can expand the winery, just a little bit. I’m sure I can convince Njamba (I figured I could convince the Chimp we also needed to test the industrial capacity of the plant, for future purposes). On the meat, we will have to see. No promises. If you can cheer a good one, and fetch us more fans, then maybe we can work out something. Ver good, thanks, we knew you are Mu-Baddest. Discretion. Any signs like we have something cooking and the deal is instantly off! Ah, very well, that bargain we can keep! Expanding the winery proved much easier than I had expected; Njamba was too future focused to see any dangers. That, or he was also excited by the prospect of becoming famous within the Box 1 borders. The Axe Gang cheering at the final was unrivalled, but I ultimately felt it wasn’t necessary. We were too strong for Madaraka sDorm anyway, putting two past them in each half. Never mind that day was Madaraka Day. I bet the Gang felt so too, for they rallied an even greater cheer lest I tried to say we were good on our own. They got us literally all form ones to do some war chants for us. And a deal is a deal, ama namna gan? As I walked forward with Joseh Santos to receive ‘Mbúri meeeee,’ I could swear I saw saliva going down the Gang’s chins. Due to my cluelessness in culinary affairs, and given I had to have a position, I was appointed head-cook, to oversee all cooking activities. I was however the lead butcher, thanks to my growing up on the farm. What was weighing me down, however, were the demands. Besides the Axe Gang, the groundsman, whom I had grown close to during my punishments, wanted a share. The dorm captain would also want a private chunk of his own, as would the guys within my circle. Most of these people had no idea- or pretended not to know- how small a goat is. 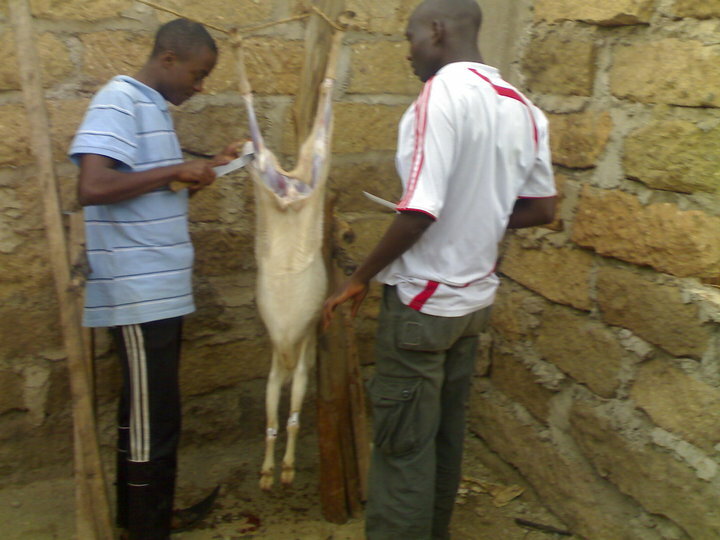 And that is how we ended up with the worst skinned goat ever, as I left chunks of meat on the skin for the groundsman to discreetly get his share. For the Axe, I had to make return trips to the meat division table and hide chunks of meat in my pockets, which I would then deliver to a waiting member as I made my head cook rounds. 1. The only downside is that I smelled like a goat for the entire week. No showering or changing could wash away the smell. Madam Elsie, my oh so lovely English teacher, teased me endlessly about it. 2. Humans forget easily, and have no gratitude. The beneficiaries of my goodwill took advantage of my smell to give me goat-related nicknames, which I won’t mention. They also made the me-eee sound whenever they saw me. Vackass!